In view of the upcoming Mother’s Day, Gu Ma Jia (姑妈家) kindly invited some bloggers for a feast and review of their home-cooked dishes. I have heard positive reviews for a while and keen to check it out myself. 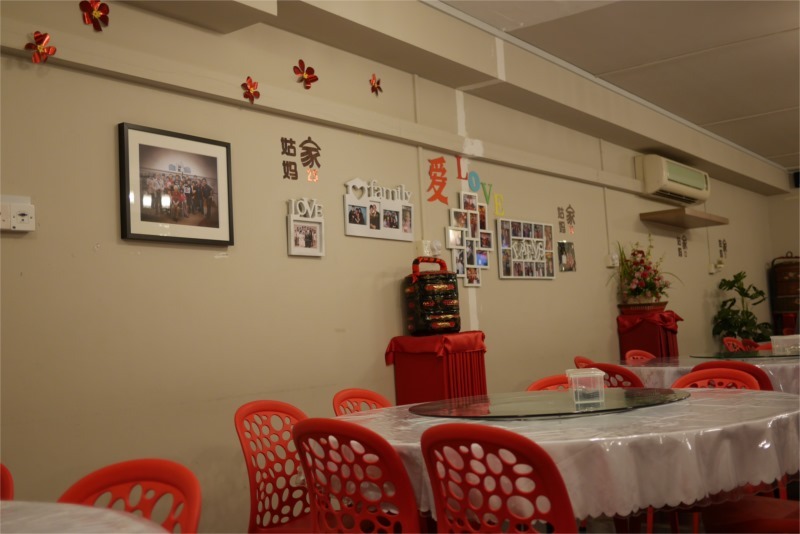 As the shop’s name implies, dining here is akin to dining at an Auntie’s house. 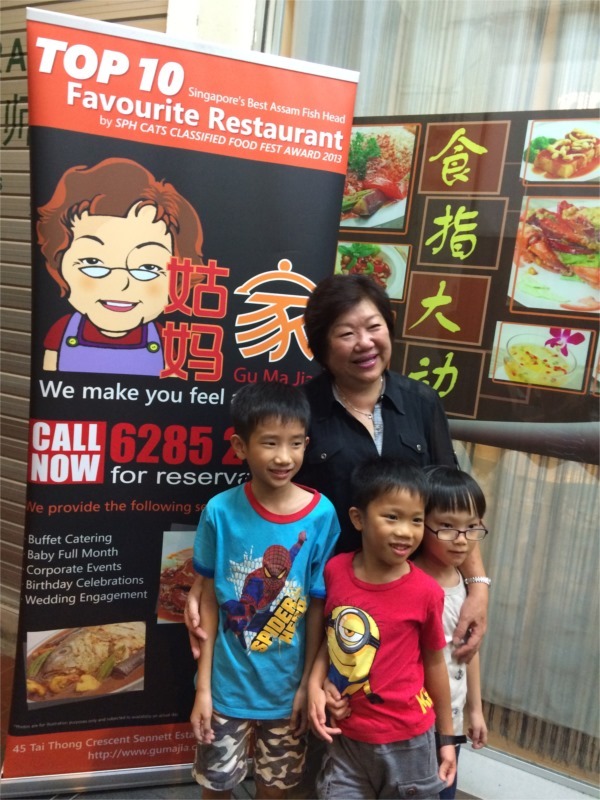 The woman behind the show is affably known as Gu Ma and she honed her cooking skills while growing up in Pulau Ubin. Together with Head Chef Yap Geok Loong from Malaysia, they created homely Chinese dishes which do warm the hearts and fill the tummies. Fruity Enzyme Drink – I am quite acquainted with fruit enzyme as my mum makes them at home! 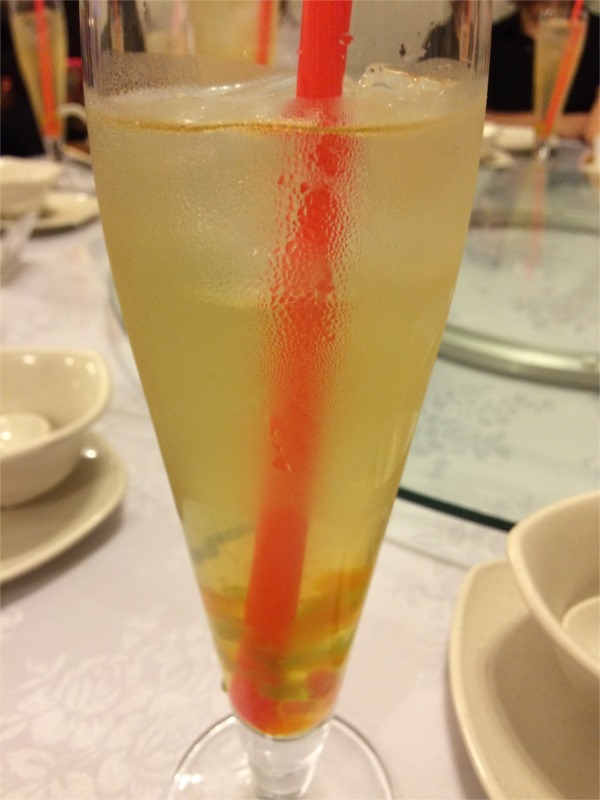 It is the liquid collected after the fermentation of fruits. There is a widespread agreement that there is good probiotic bacteria in fruit enzyme. But honestly, I have yet to fully appreciate it’s slight sour taste. The jelly at the bottom does help to make it more palatable for our taste buds. 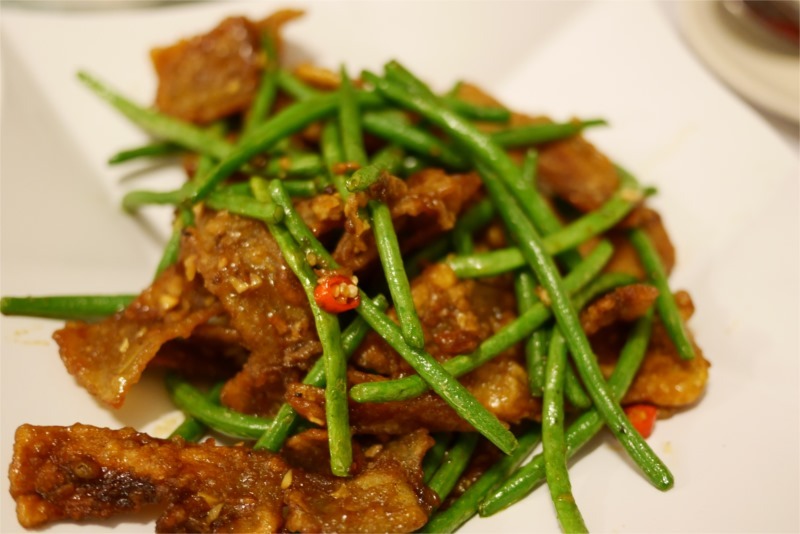 Crispy Bean Jal – Often mistaken as bacon, this is actually deep fried brinjal with four season beans. The dish see me going for seconds just because it doesn’t taste like eggplant! Coated with marmite-like sweet sauce, this is seriously addictive. 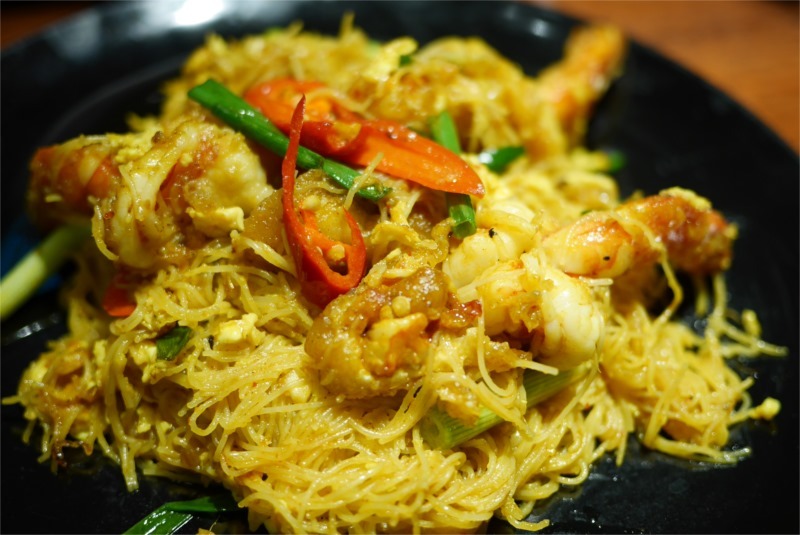 Ubin Lala Bee Hoon – the highlight is not the lala. 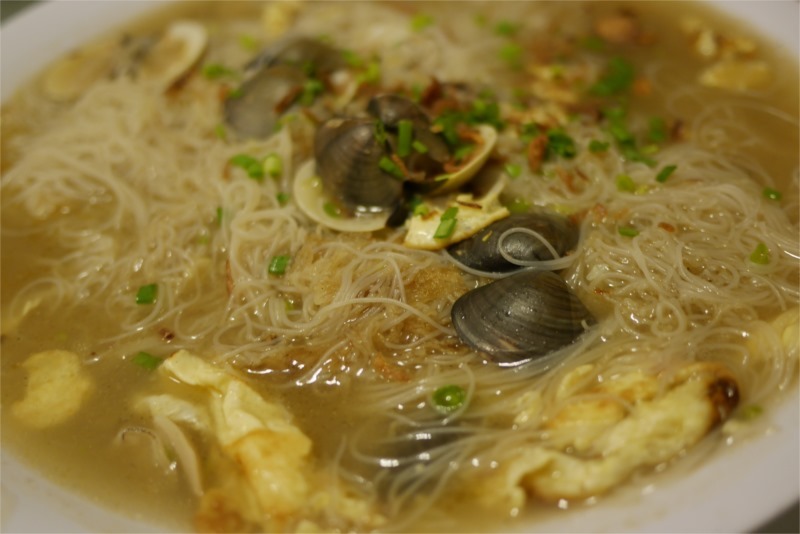 It is the wet beehoon soaked in savoury broth! I am a fan of wet beehoon and this goes down very well with me. The beehoon is unlike some which you found at zi char stalls where they barely boil the beehoon and throw the gravy on top. This Pulau-Ubin style dish is soaked through with flavours. A must-order. 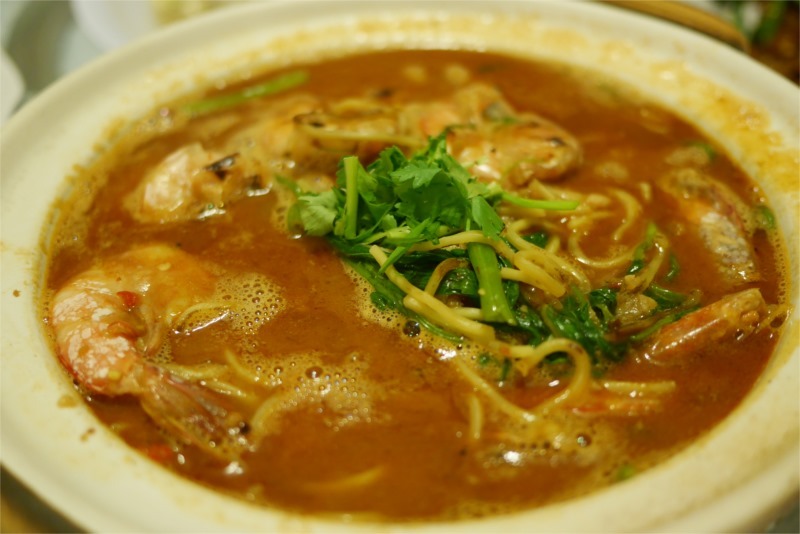 XO Prawn Noodles – the photo doesn’t do the dish justice. A classic Cantonese dish, the special home-made XO sauce (almost soup-like) made me eat more of the yellow noodles which I would have normally avoided. Fresh succulent big prawns are the highlights too! A must-try. 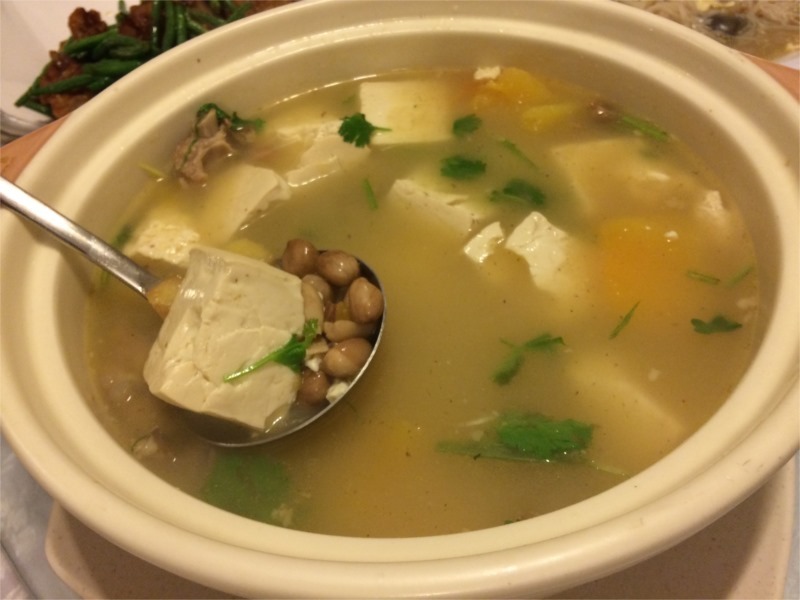 Gu Ma Signature Traditional Bean Curd Soup – This plain looking soup is no plain Jane. It is power boiled over 6 hours with ingredients such as salted fish head, Chinese ham, pork ribs, peanuts and bean curd. I loved the wholesome taste and Xi En had more than a bowl too. Really comforting double boiled goodness. 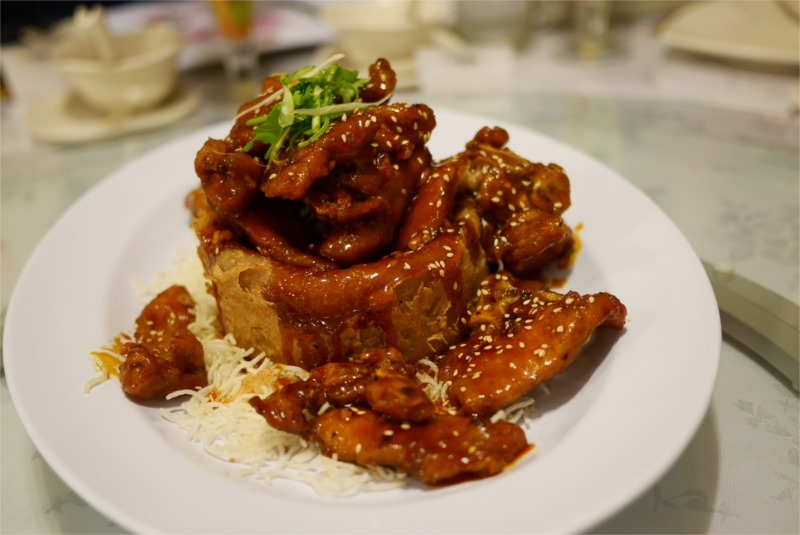 Homemade Yam Ring with Kyoto Pork Ribs – Lip smacking sweet ribs (no bones, yeah!) with creamy and crispy yam ring. I will order this again. 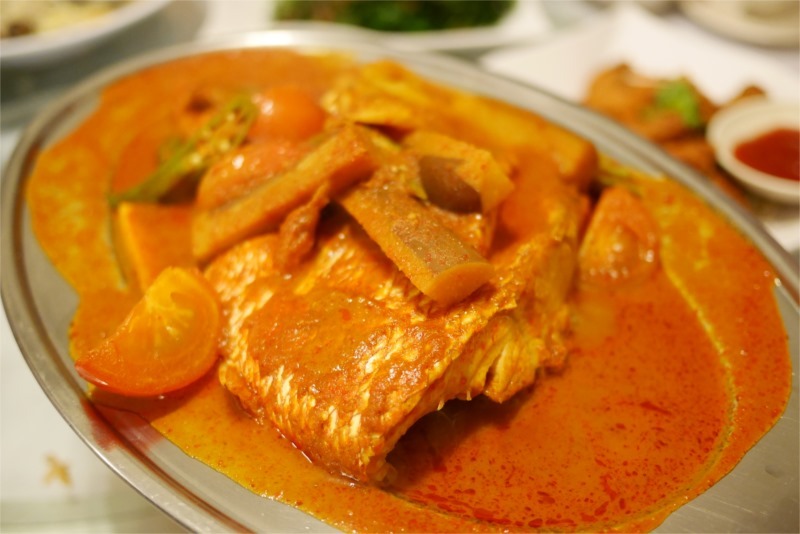 Assam Fish Head – Not too spicy and you can still taste the sweetness of the flesh amidst the spices. Gravy goes well with rice definitely; might be too small a portion for the real fish lovers though. 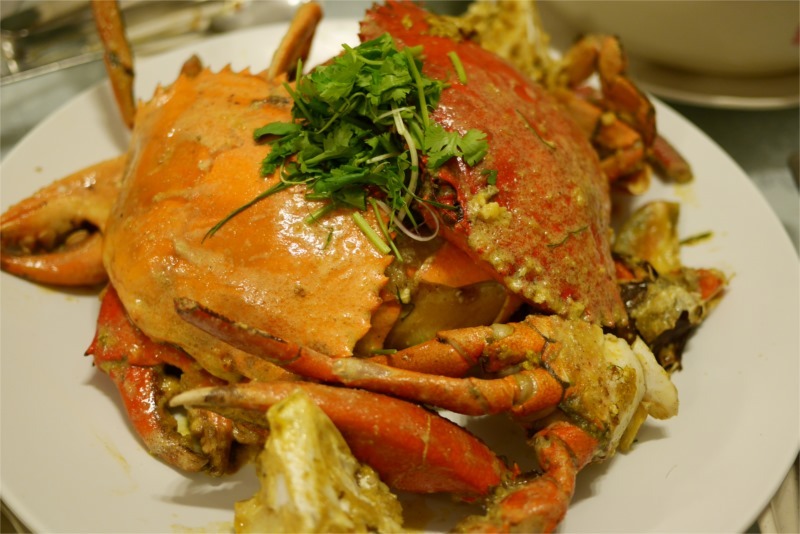 Salted Egg Yolk Crab – My favourite next to chilli crab. The flesh comes off the shell easily and the salted egg yolk is fingers-licking good! 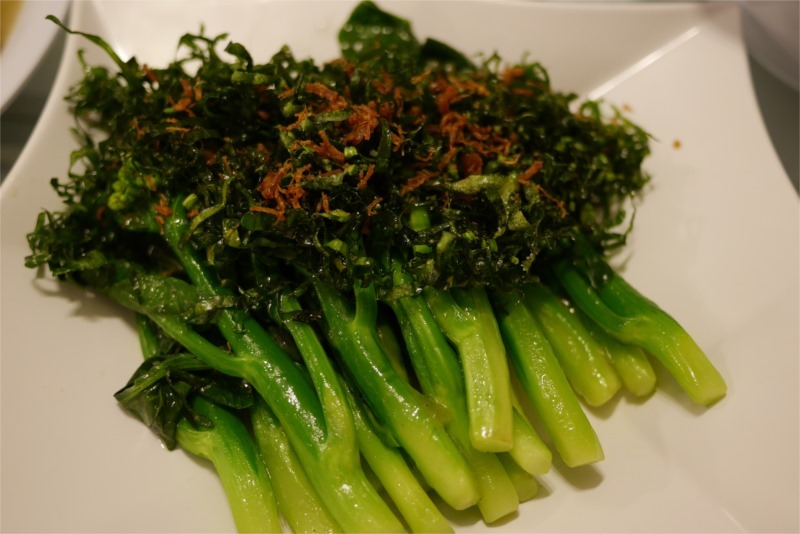 Yuan Yang Kai Lan – Kai Lan done in 2 way – blanched and fried. It’s like 2-in-1 shampoo I think. If you can’t decide how to have your vegetables, how about having them 2 ways? 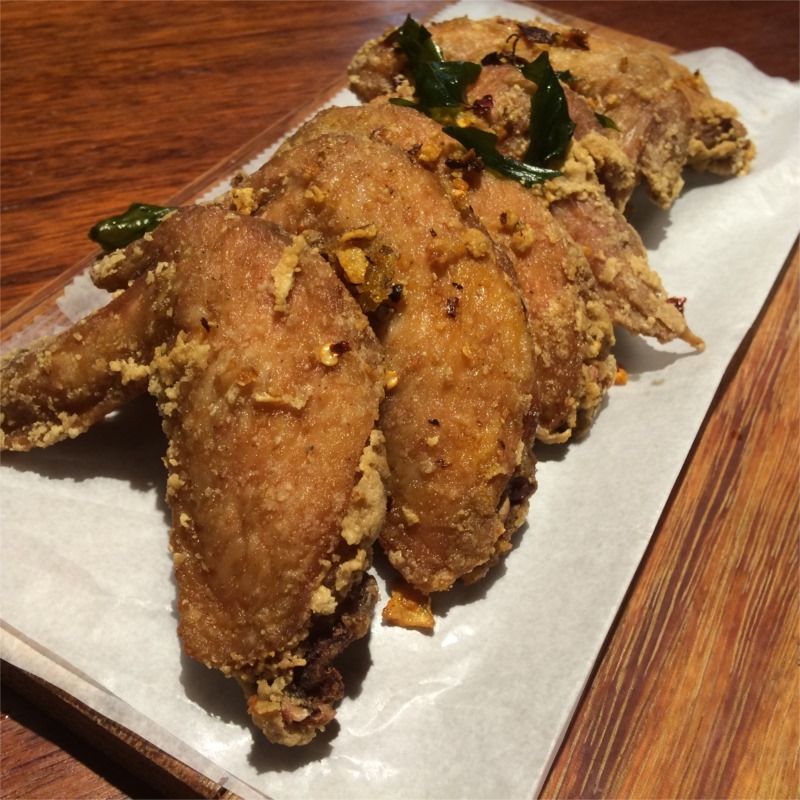 Shrimp paste chicken mid joint – A common dish but not all chefs get them well. This is above average with the right amount of shrimp paste though I could have them crispier. Mango Pudding – Not on menu yet. Fruity Enzyme Jelly – $5.80 (this is an acquired taste. you need to appreciate enzyme in order to like the healthier dessert option). Husband and I agreed that the dishes are homely fare cooked in a more meticulous way. It is similar to having a meal at your “Auntie’s” house except it might actually be better than hers! With no additional MSG, less oil and healthier food options (such as brown rice), you can be sure Gu Ma Jia is a Mummies-approved place. 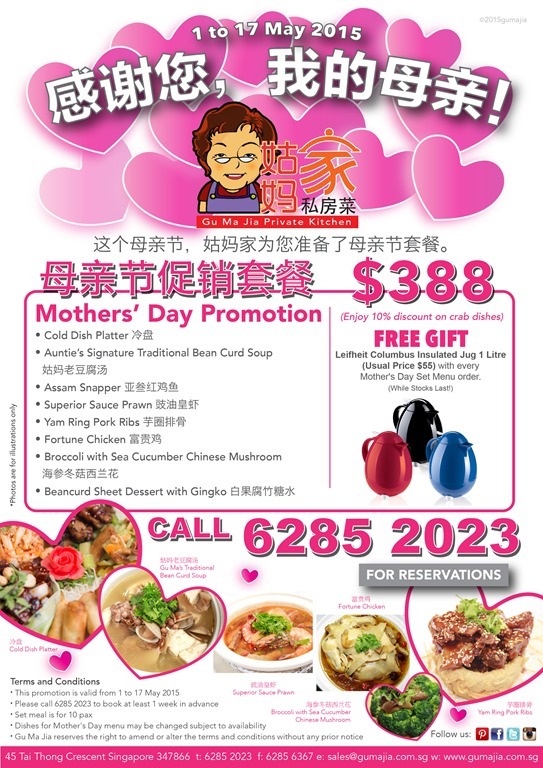 For the upcoming Mother’s Day, there is a promotion and a set menu which is available from 1st May to 17th May 2015. Details as below. Ala carte options are available too. Do make an early reservation if you are planning for Mother’s Day. Parking are available along the roadsides but be prepared to wait a while during peak dining hours. N.B: We were kindly invited for a food tasting session. All opinions and photos are ours except credited. No further compensation is received. Get Saucy, Salty and Wet this Songkran! For the uninitiated, Songkran refers to the traditional New Year’s Day which is celebrated from 13th to 15th April in Thailand. If you are in the county, get ready to be drenched, soaked, poured, sprayed with water – a symbol of washing away all the bad. Well, if you are not in Thailand during that season, fret not. Soak up the atmosphere with sizzling spicy food at your friendly ThaiExpress or Basil! 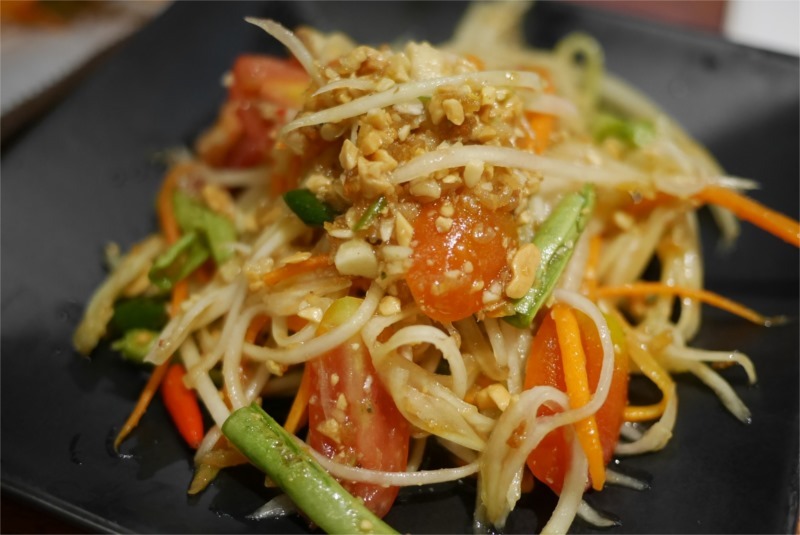 We were kindly invited to sample the new dishes in conjunction with the Songkran festival at Basil by ThaiExpress. 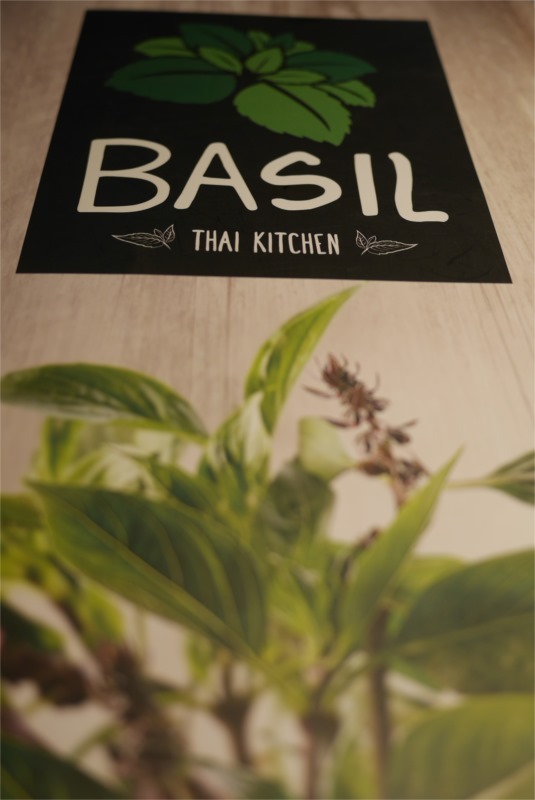 Basil is a contemporary casual dining restaurant with a fresh and young interpretation on Thai food. I actually prefer Basil’s fresh outlook and “hipper” feel. It’s located at Kallang Wave, Sport Hub Retail Mall if you will like to check it out. Now now now…. what is there not to like about deep fried chicken wings???!!!! 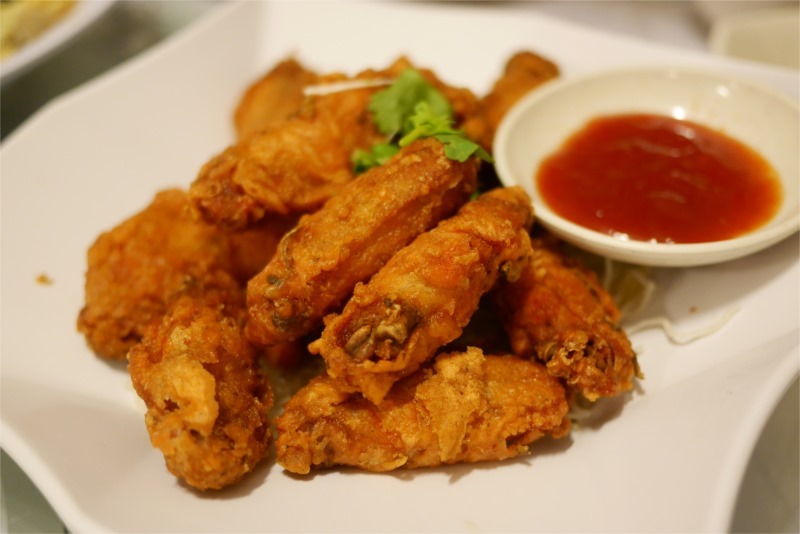 If there is any food that you can bribe me with; it got to be fried chicken wings. 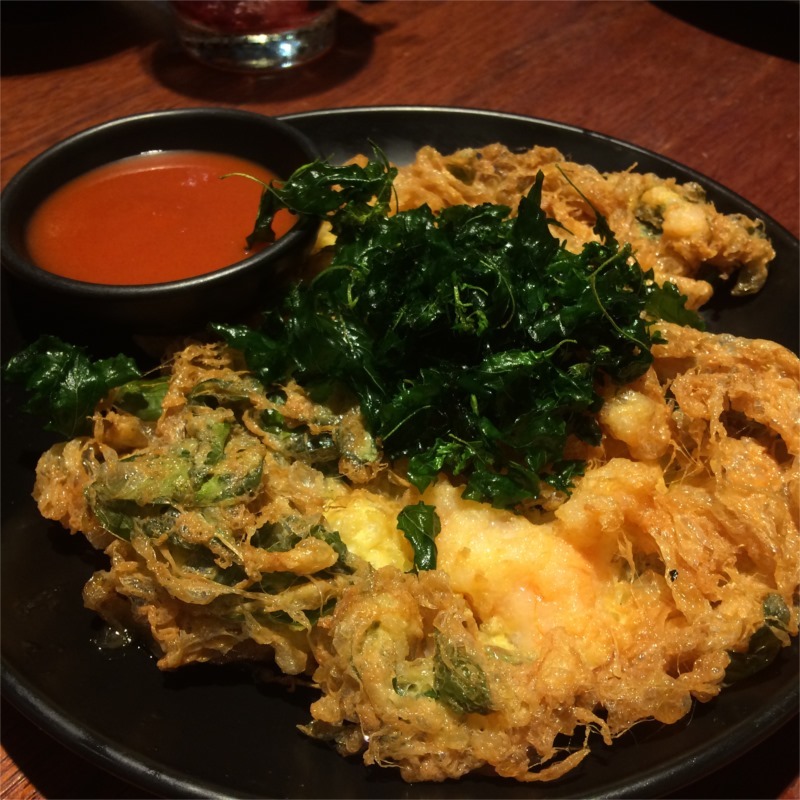 We try not to deep fry too much at home and thus my indulgence got to be fulfilled when we dine out. 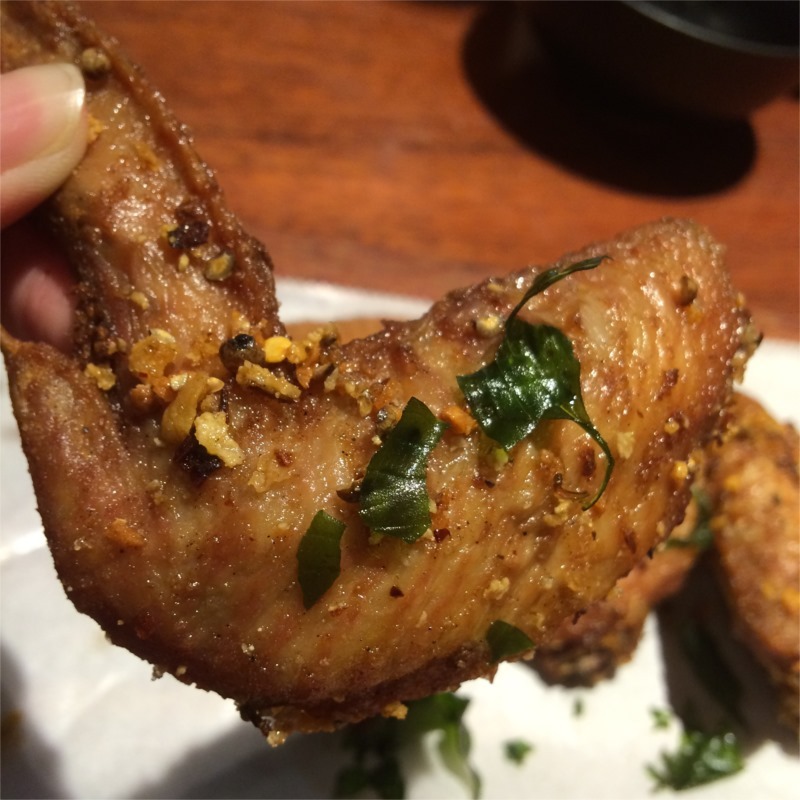 These wings are specially sprinkled with crispy basil leaves, fried garlic flakes, dried chilli, salt and sugar. It could do better with a longer time in marinating to give the meat more depth but otherwise, I will devour any chicken wings with crispy golden brown skins! Yes – I eat skins! Do you? 😛 (Gone with that diet-plan for now). My 2 favourite ingredients doing a duet! This is something tough to duplicate at home due to the high heat needed for this dish to taste good. 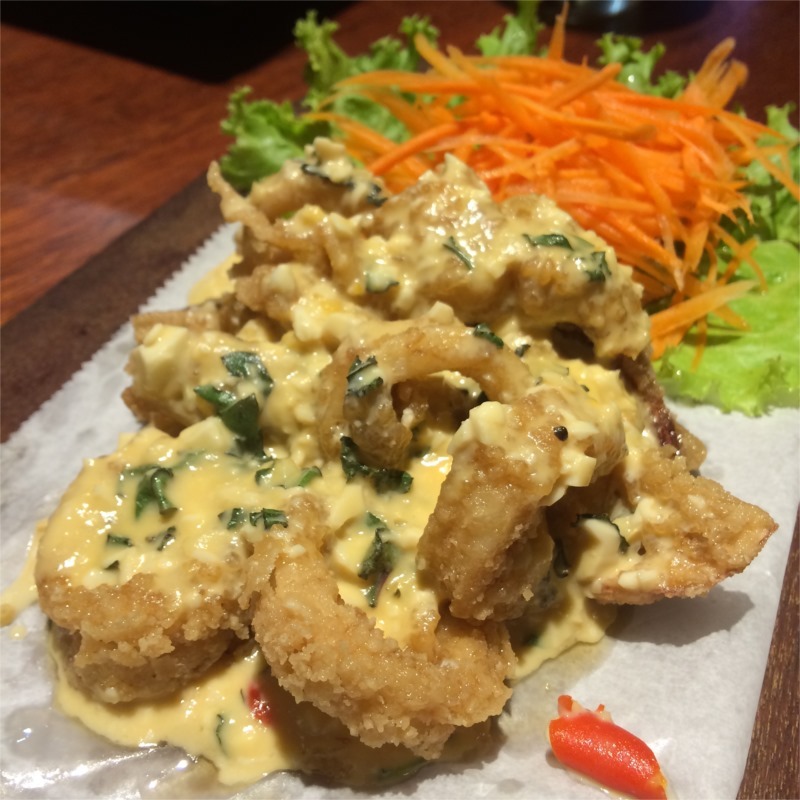 With a unique sweet-creamy salted egg sauce coupled with a slight tinge of basil and spice, it marries the squid pretty well. A twist to the usual salted egg dishes, try this for a twist in your usual salted egg dishes. I hate papaya. period. I dislike papaya to the core! Chewy sliced ribeye beef tossed in chilli & lime dressing and sprinkled with roasted rice. This is a chef recommendation and I totally agree. Load up if you like your beef spicy! I enjoyed this while the hubby felt it’s a little too spicy for him. 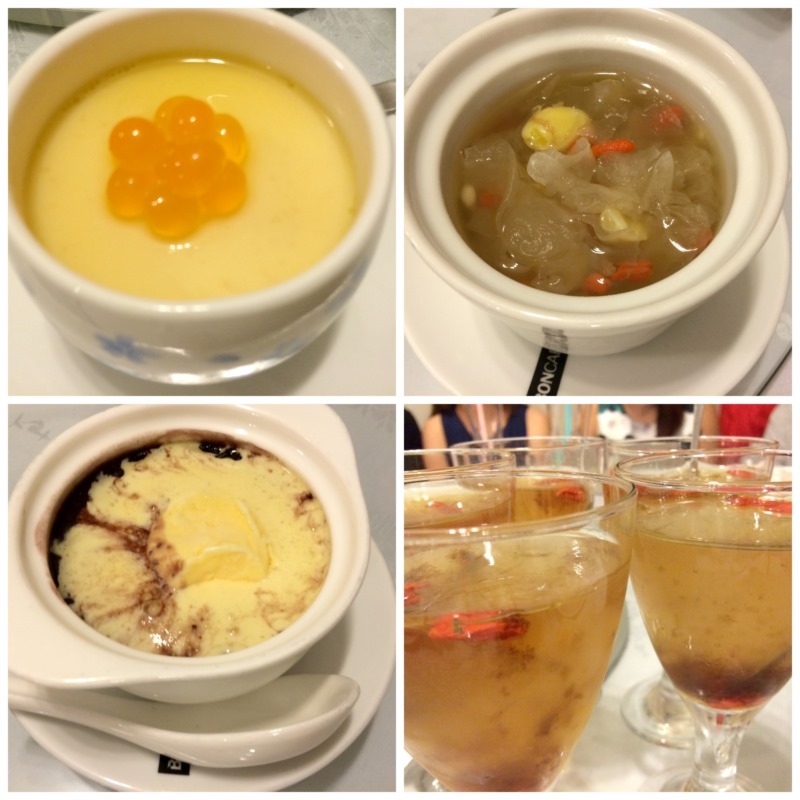 Lastly we sampled almost all the desserts! 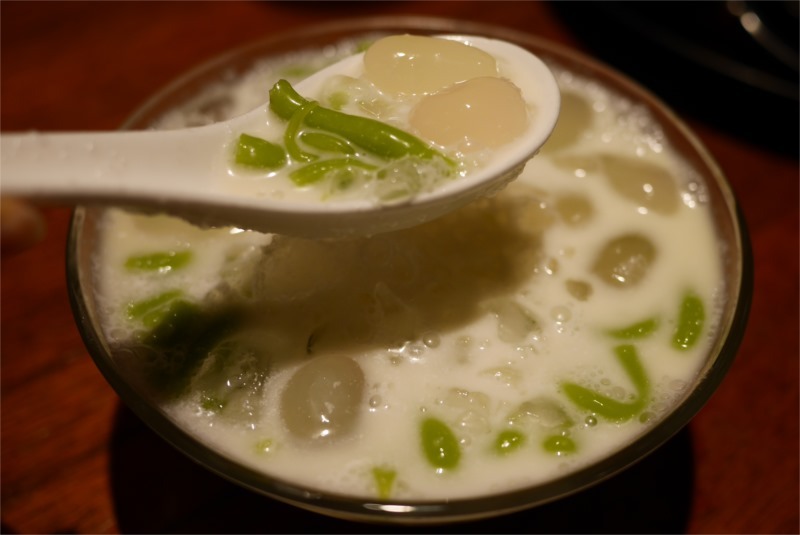 Thai desserts are sweet and sweet! If you like your desserts sweet, you have to order one here. 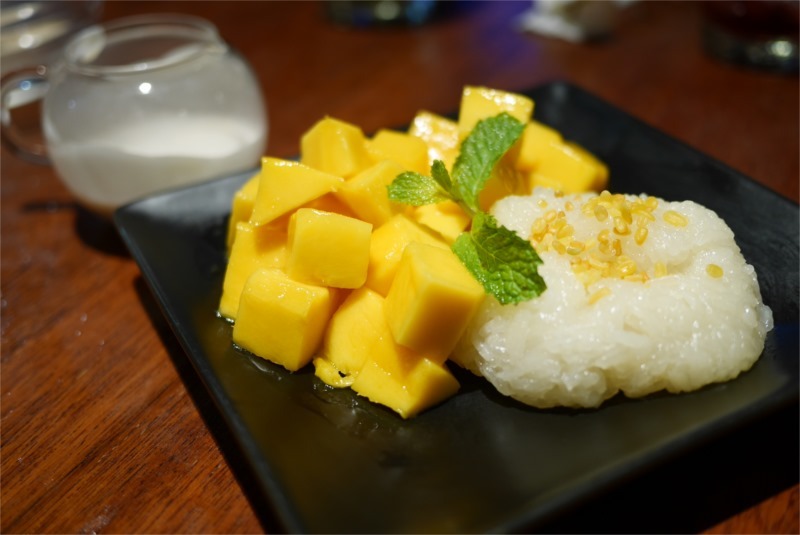 Good quality mangos on a bed of warm sticky rice served with fresh coconut cream; B.E.S.T. combination. If you have tummy space for only 1 dessert, got-to-try-this. Not my first time having Lod Chong but I kinda forgotten it’s name! The lod chong is freshly home-made and has a slightly herby-fresh taste (like chewing on a fresh mint). It goes well with the sweet coconut-based dessert. Good for those who might like a lighter taste for desserts. In collaboration with Bangkok Airways and Tourism Authority of Thailand, ThaiExpress will be giving away a pair f return Business Class tickets to Bangkok and Koh Samui to experience the festival of SOngkran in Thailand itelse.f! Winners will fly off on 10th April to Koh Samui, stay 1 night in Anantara Lawana Samui Resrt & Spa –Deluxe Plunge Pool Room from 10th to 11th April followed by 3 night stay in a 1 bedroom Suite in Anantara Sathorn Bangkok from 11th to 14th April 2015. The accommodations include breakfast and a round trip airport transfer. Simply spend a minimum of $50 (before GST and service charge) to get a free mini water gun (great for waterplay!) and a unique code to enter the lucky draw for the grand prize. The unique codes will be given out till 29th March and the winner will be announced on ThaiExpress’ Facebook Page on 1st April 2015. Don’t miss the promotion now! 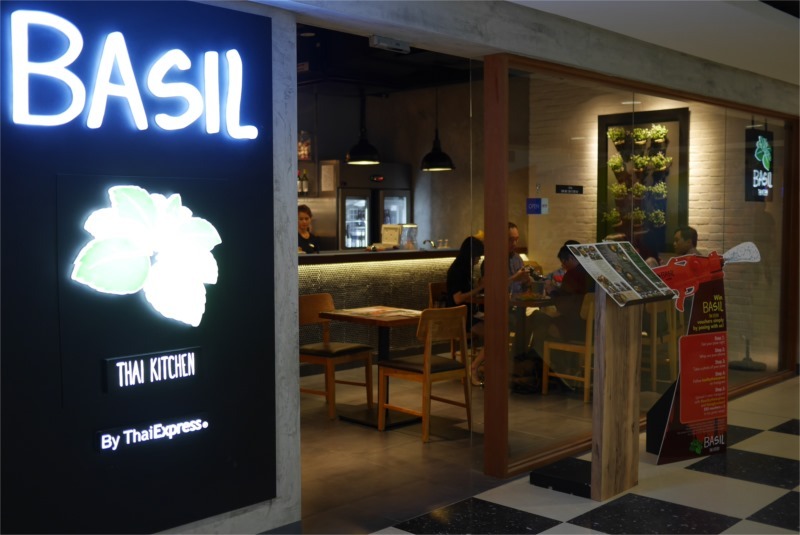 Check ThaiExpress website: www.thaiexpress.com.sg and Basil: http://basil.com.sg/ for more details and locations of outlets. ^Songkran promotional dishes will be available 9th March till 19th April 2015. 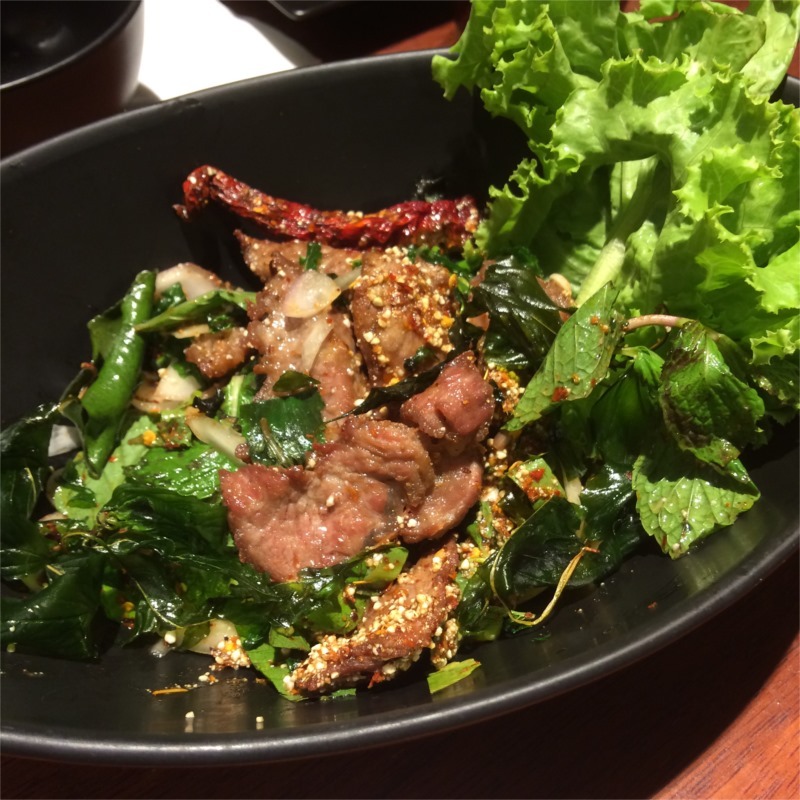 Disclaimer: We were kindly invited to sample the new dishes in line with Songkran festival. No other compensation had been received. All photos and opinions remain blogger’s own. Flabbier tummy included. 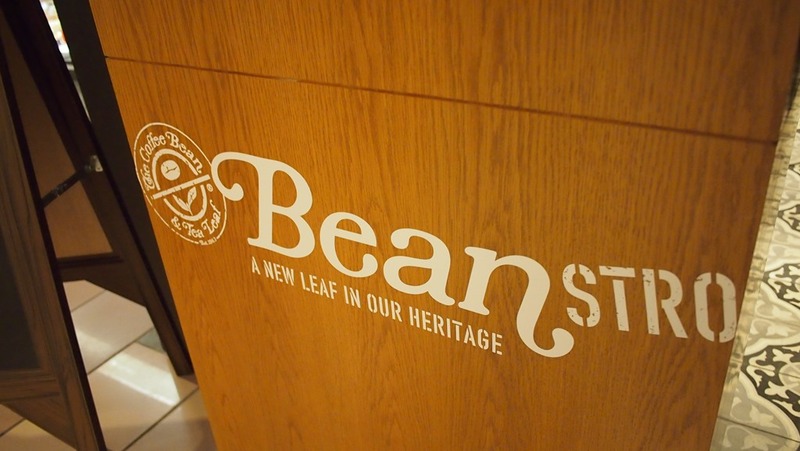 We were invited for a food tasting last week at Beanstro – a casual dining restaurant by The Coffee Bean & Tea Leaf. 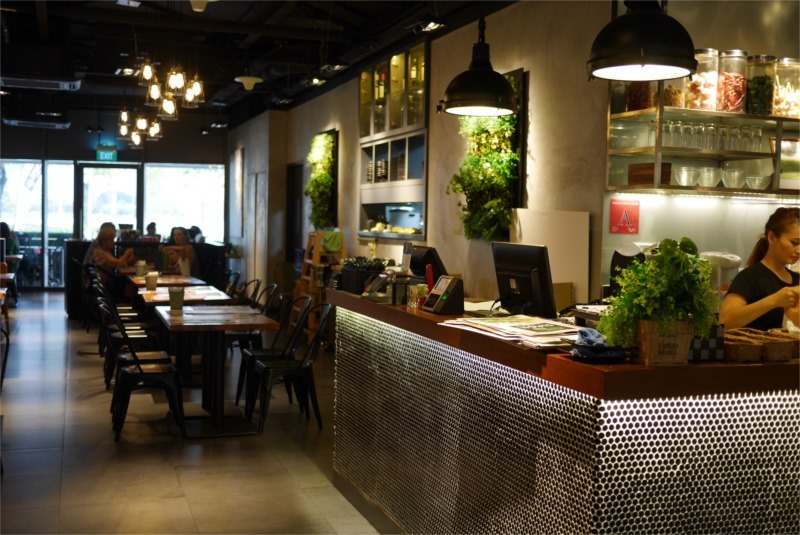 If you go shopping at Ngee Ann City often, it’s hard to miss this restaurant. You will see the familiar brown and woody deco when you glance upwards from the atrium. 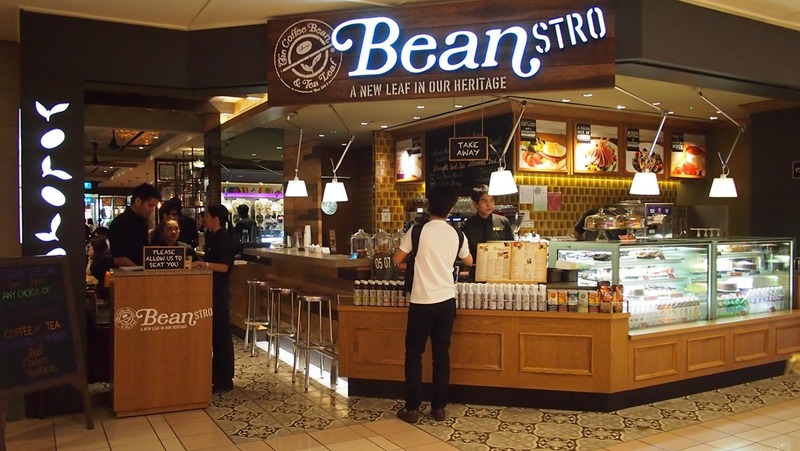 This is their second halal-certified Beanstro. The first successful outlet is located at Marina Bay Sands. 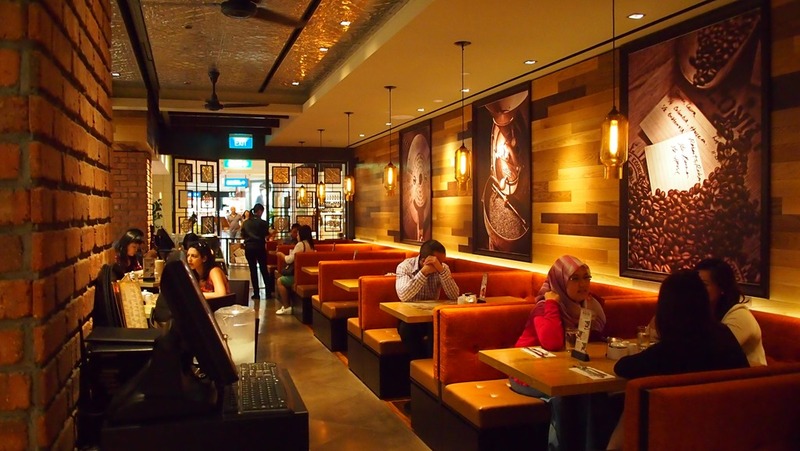 The company has plans to open up 2 more restaurants in Singapore. We were ushered in promptly. The warm lighting and cozy ambience set the mood for a great lunch! I love restaurants which provide booth-like seats. Beanstro has them in U-shapes; thus making it easier to seat more people comfortably. 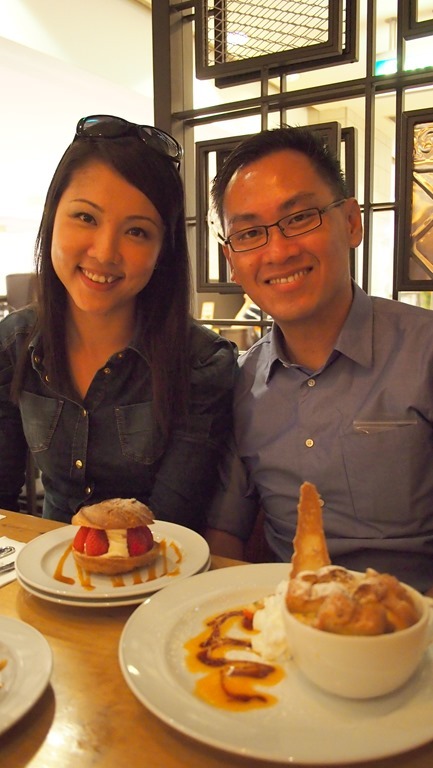 I brought along 2 makan-kakis – Siangling & Maxie – who share common love for food. A senior server attended to us while we pored over the menu; trying to decide what to order from the extensive American-style options. Finally we decided to share selections from the various categories so as to sample a wider variety. After we placed our orders, Steven – the restaurant manager – came by and apologised that he was away when we arrived. He said that he had a look through our orders and would like to recommend some others as those are the signatures. We were happy to take on his suggestions. 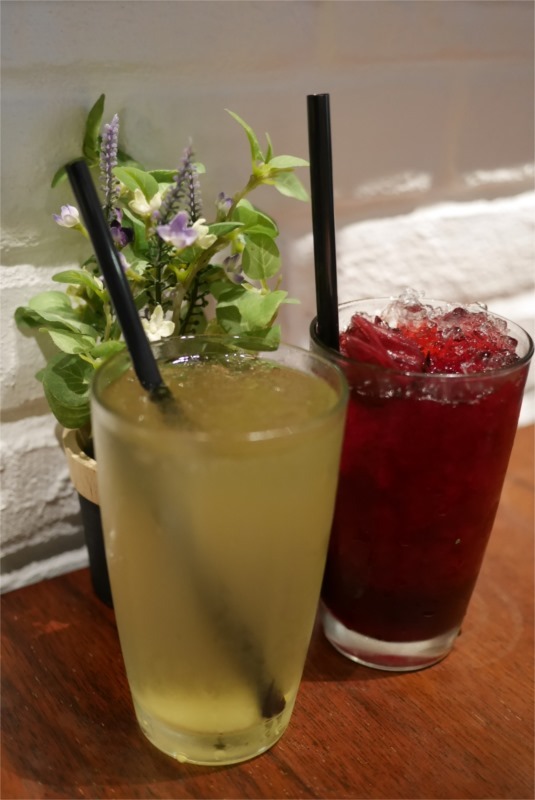 Our drinks – Sunrise, Mucho Mango Fru Tea & Black Forest. 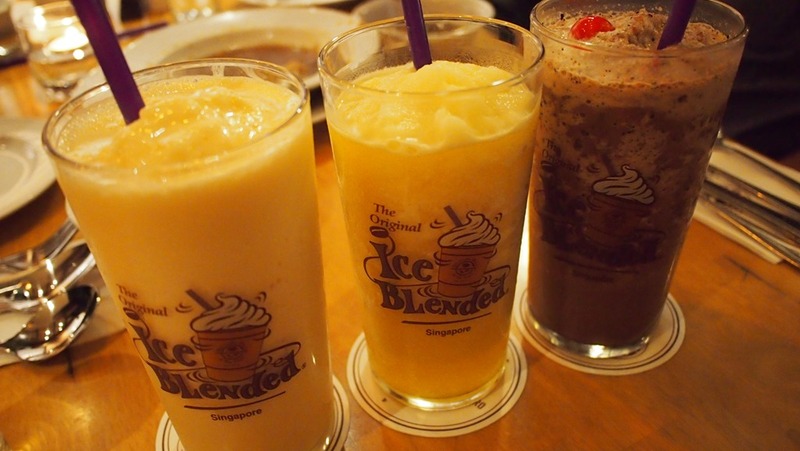 All familiar drinks well mastered by Coffee Bean & Tea Leaf; can’t go wrong with it. 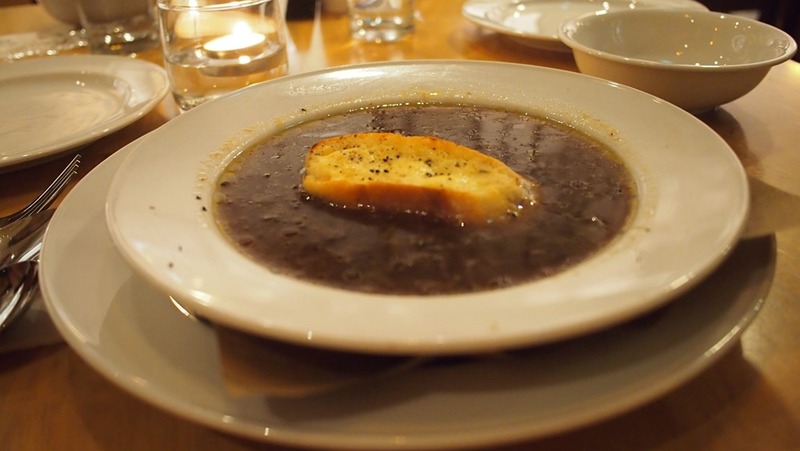 First dish served up is one of their rustic soups: French Onion Soup. Most of the time, it’s not my first choice of soup but I must say this proved me wrong! The piece of cheese toast complemented the soup too. Yumz! 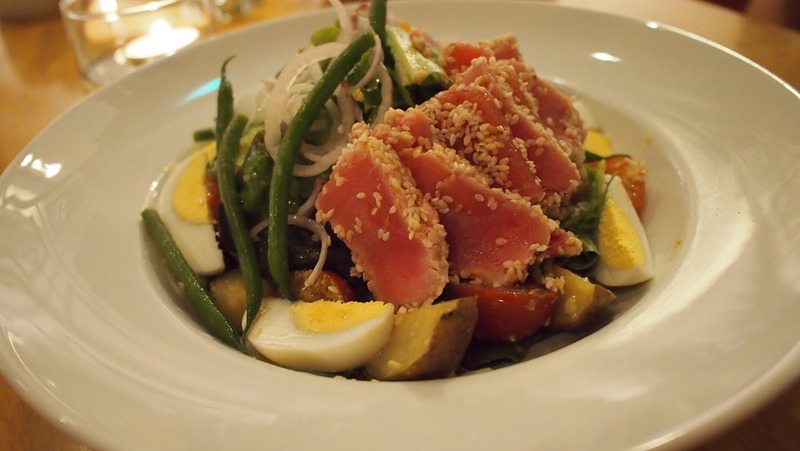 Next up is one of their signatures: Tuna Nicoise. This is a classic French dish; yellow-fin tuna loin coated with sesame. The tuna is soft on the inside and slightly pinked on the edges. The accompanying raw onion and cheery tomato went well together with the tuna. One of them was the Classic Eggs Benedict. This was strongly recommended by Steven – a “MUST TRY”. 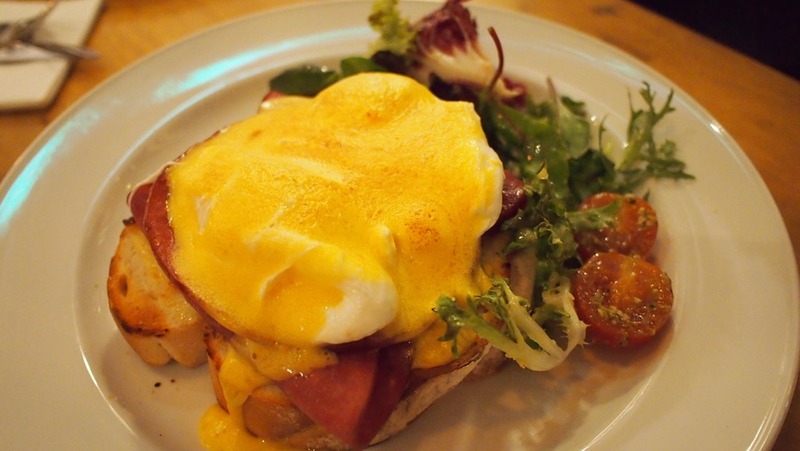 The poached eggs with hollandaise sauce were my all-time favourite being runny and gooey. However the chicken ham was a little disappointing; taste being too processed and tough. Otherwise, it’s a fair recommendation for a hearty meal. 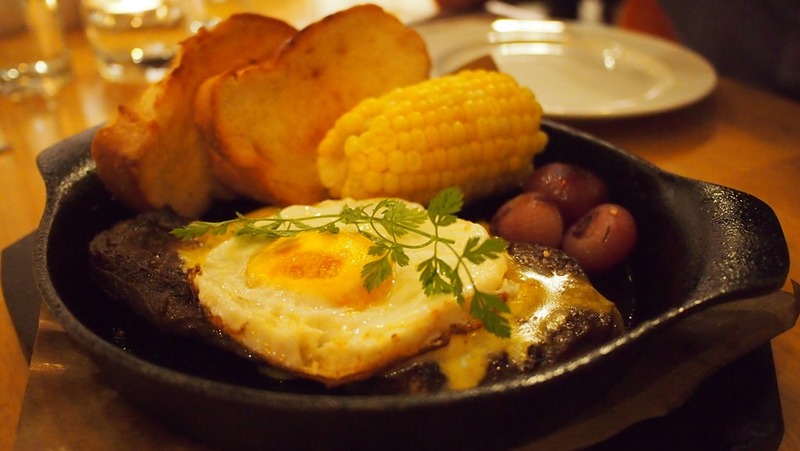 2nd breakfast item which we choose was the Breakfast Steak and Eggs. The accompanying blackcurrant onions were yummy and sweet! Unfortunately, the beef sirloin was overdone and a tad too tough for our liking. 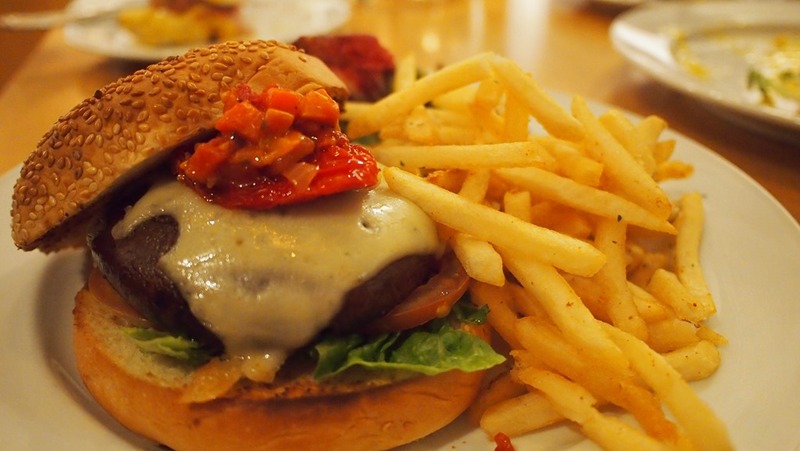 1) The Grilled Portobello mushroom with melted Emmental cheese and ragout of capsicum, sun-dried tomatoes, arugula. The mushroom was grilled nicely; a little crunchy on the outside without losing the mushroom flavour on the inside. Perhaps I love a more robust taste; thus felt that further marinates will enhance this dish. 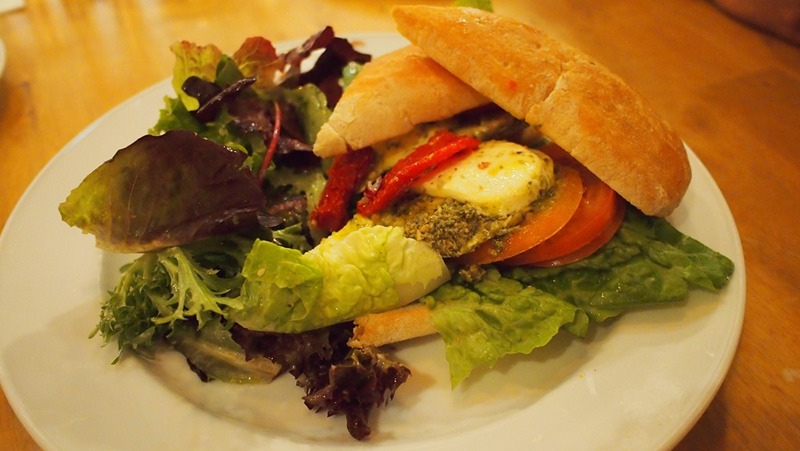 2) Caprese – Grilled Ciabatta Sandwich with fresh mozzarella cheese and semi-dried tomato & pesto. I loved this! Simple but oh-so fresh ingredients won my taste buds! This make a quick and light afternoon snack. Worth a try if you are not in a meat-y mood. 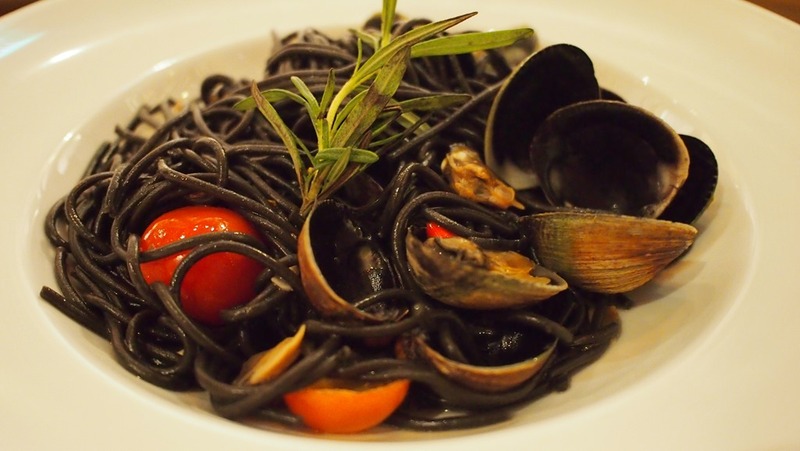 A worthy mention is their signature: Vongole – Squid ink spaghetti with New Zealand clams tossed in extra virgin olive oil. Steven told us that because Beanstro is a halal-certified restaurant, the chef cannot use wine in this dish which is commonly used in the preparation. 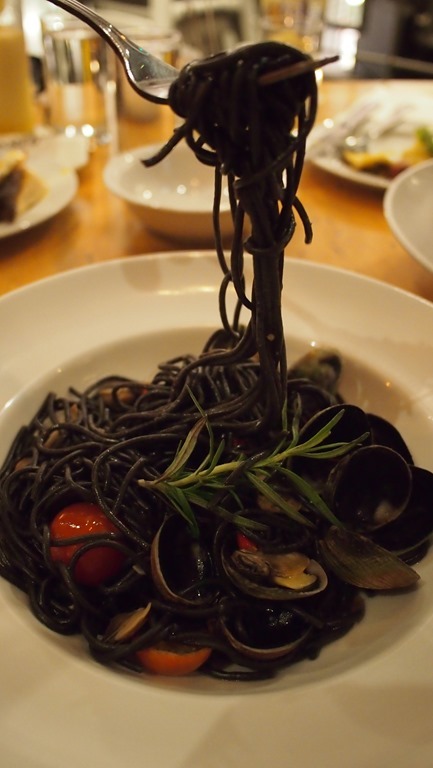 Instead, the clever use of chilli-padi gave this dish its’ kick and I love the fact that your mouth won’t be smeared with squid ink on a hot date! 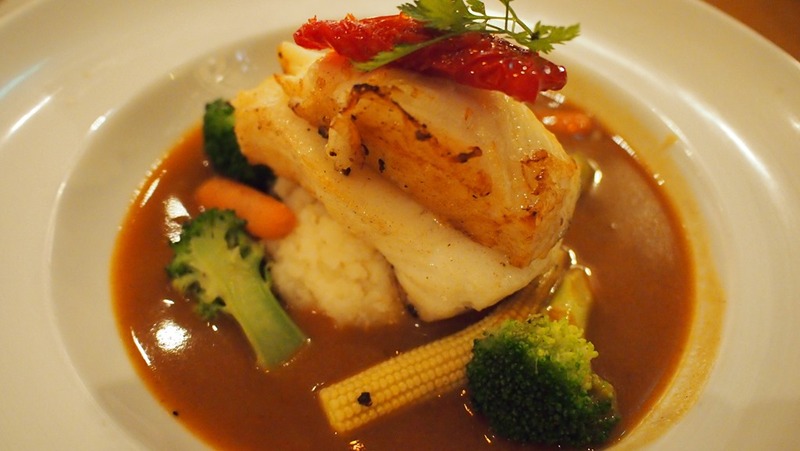 We also had the Chilean cod fish with mashed potatoes and sautéed greens in a seafood broth. I am not a fan of fish dishes due to presence of bones and their fishy smell/taste; thus I would normally avoid ordering them. Our in-house food gourmet commenter (Maxie) said the best way to know if a restaurant does a good job is to order their fishes. And that we did! I must say the cod is fresh and when served with the seafood broth; there is no fishy taste whatsoever. Bread & Butter Pudding (my all-time favourite!) and Cheery Clafouti. 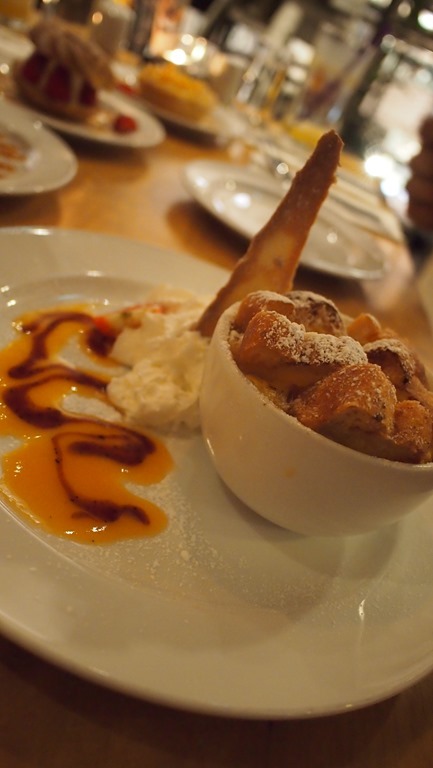 The bread & butter pudding was served in a mug-sized bowl. The buttery sweet bread was a prefect contrast with the tangy-lemony sauce & its’ serving is just nice for a sweet ending. 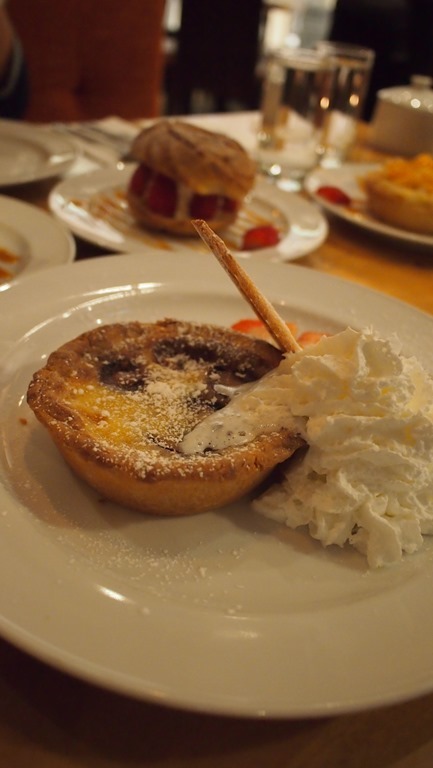 My two companions loved the cherry clafouti – it’s sweet/sour taste. Overall it was a pleasant dining experience. Thank you Beanstro & my 2 makan-kakis for joining me! 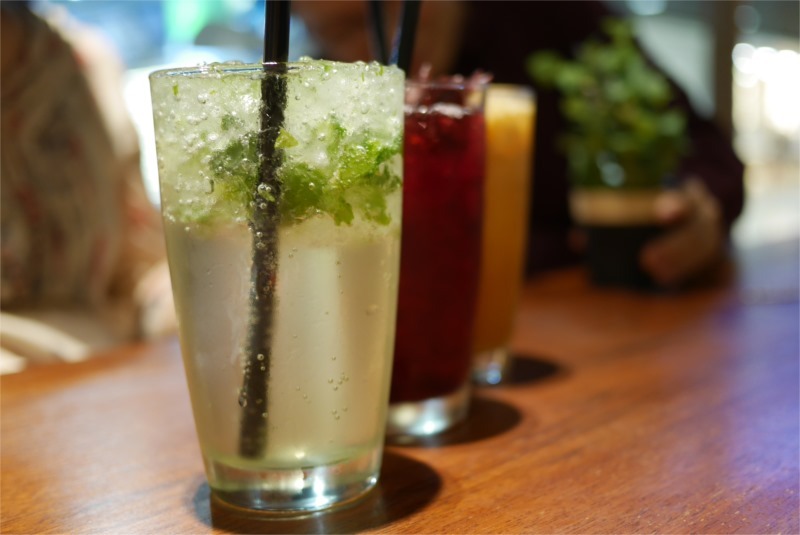 A conveniently located beanstro with a cozy setting for catch-ups with friends; a place for a cuppa & dessert to rest your legs after shopping the halls or a full hearty course with the family! Do check it up when you are next in town. N.B: This is a sponsored food tasting review. All photos and opinions are based on personal dining experience on premise.